Let Domingo and his team design an excursion that fits your budget, likes, and abilities! From Horseback Riding to Whale Watching, Beaches to Waterfalls, or a relaxing tour thru the city, tropical gardens, or around the peninsula. Fun loving and speaking both Spanish and English Rancho Tipico will help you enjoy the most from Samana! For an adventure you will never forget, join Domingo and friends on a horseback ride across the countryside! Ride along the river, and through trails enjoying the foliage and flowers of Samana. Ride through villages where children run up with flowers, fruit or just to say Hola! Ride past fields of horses, sheep, goats and cows! Ride to a beautiful secluded sandy beach, and around the rocky cliffs. Take a short hike to a beautiful falls where you can swim if you like. Relax and enjoy the scenery as we bring you home from your unforgettable adventure. 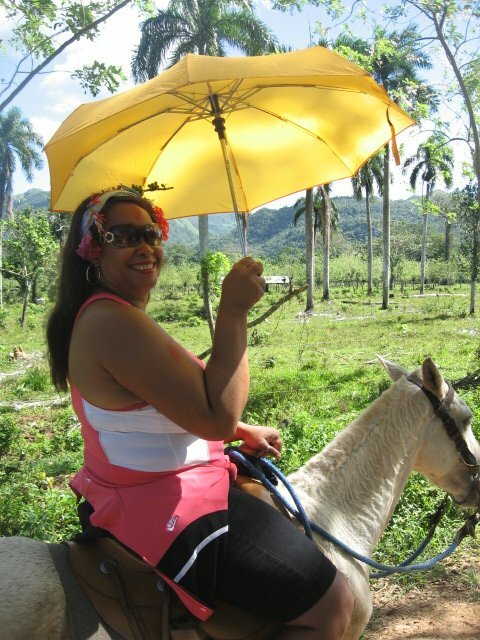 Ride through the Dominican countryside enjoying the beautiful hills, foliage, flowers, fruit trees and more. Meander through a small village where everyone greets you with a smile, children run along finding you fresh fruit and flowers. Burro’s carrying the daily load, freshly washed clothes hanging along fence lines, chickens scurrying, and the air is fresh and clean. Take a break while visiting a "Casa Tipica" where you enjoy the local fruit and learn about local agriculture. As the ride continues you will soon feel the ocean breeze and smell the salty air of the beautiful blue warm waters and sandy beaches. Enjoy riding along a lovely secluded sandy beach surrounded by the majesty of rocks and coral met by a fresh water river. Coconut trees line the beach and provide shade where you can sip a cool drink. While you are relaxing or riding a special lunch of locally caught fish and chicken grilled on an open fire, Dominican style side dishes including fruits of the season, is being prepared for your enjoyment. But the day is not over yet. Stretch your legs as you take a short but beautiful hike down a path through lush foliage and bamboo winding beside the river. Young boys help you along the way as you cross a stream (on “stepping stones”) and soon you are likely to see one or two shinnying up a very tall tree to show off their high diving skills at the site of a breathtakingly beautiful waterfall. If you are up to a cool dip now’s your chance! During your trip you will discover how local fruits, seeds and leaves are used. Dominican coffee beans grow wild along the trail. See the Cocoa tree, taste its fruit and learn how they make chocolate from it. There’s so much to do and see behind the scenes of Samana in the Dominican Republic. Enjoy this all inclusive full day Dominican retreat on horseback! Other Recommended Places to stay and things to do —- Click HERE! and recommended by the best local hotels and cruise lines.